2018 Honda RC213V-S. Picture credits - Honda. Submit more pictures. The RC213V-S uses a 1000cc 90-degree V-4 with a 360-degree crank and gear-driven cams. This is the engine architecture Honda has made famous on the track, winning back-to-back titles in 2013 and 2014. Engine braking is four-way adjustable, working in conjunction with Honda Selectable Torque Control. Compact, powerful, and offering both peak power and huge torque. Front brakes: Double disc. Brembo. Hydraulic. Four-piston calipers. Rear brakes: Single disc. Brembo. Hydraulic. Two-piston calipers. Comments: RC213V-S is the road-going version of RC213V. 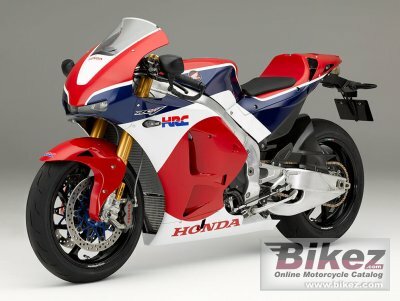 Ask questions Join the 18 Honda RC213V-S discussion group or the general Honda discussion group. Bikez.biz has an efficient motorcycle classifieds. Ads are free. Click here to sell a used 2018 Honda RC213V-S or advertise any other MC for sale. You can list all 2018 Honda RC213V-S available and also sign up for e-mail notification when such bikes are advertised in the future. Bikez has a high number of users looking for used bikes. Before you buy this bike, you should view the list of related motorbikes Compare technical specs. Look at photos. And check out the rating of the bike's engine performance, repair costs, etc.